All flowering today. 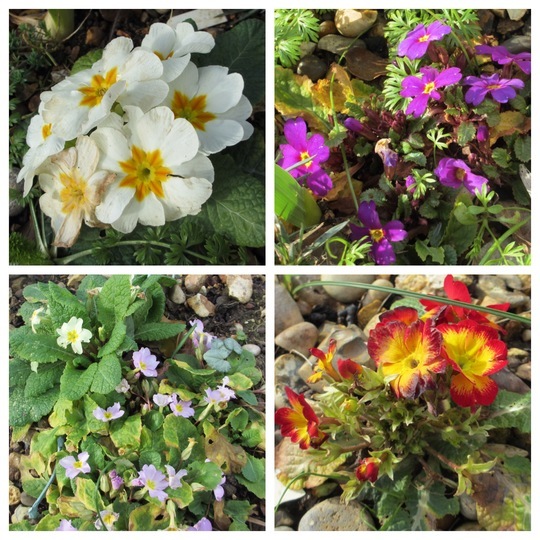 The pink ones are self crosses between Primroses and purple Wanda, top right. A lovely selection of colours. The cream and the red/yellow are last year's bargain tray, the blue one is only just coming into bloom, so missed the photo. I've just bought a bargain tray of 6 pink ones, 50p. Some bargains to be had ATM, the hot weather has surprised the sellers, everything going over too quickly! This photo is of species Primula. See who else has plants in genus Primula.